Virgin Australia says cost reductions and the improved performance of its low-cost subsidiary Tigerair Australia have led to a reduced full year loss of $93.8 million for 2014/15. The company reported a statutory net loss after tax of $93.8 million for the 12 months to June 30 2015, a $261.8 million improvement from the $355.6 million net loss in the prior corresponding period. For the fourth quarter, or three months to June 30, the statutory net loss was $17.8 million, compared with a $178.2 million net loss in the prior corresponding quarter, Virgin said on Wednesday. “The result represents a significant year on year improvement in performance for the seasonally weaker June quarter and we expect to see a continued positive trajectory,” Virgin chief financial officer Sankar Narayan said in a statement. On an underlying basis, which the airline regarded as the best indicator of financial performance, Virgin posted an underlying loss before tax of $49 million for 2014/15, an improvement of $213 million from the prior year. The result was better than market expectations of an underlying loss in excess of $60 million for the year. The underlying loss for the fourth quarter was $36.9 million, down from $83.1 million in the prior corresponding quarter. Virgin said yields, or average airfares per passenger, were higher in the fourth quarter of 2014/15 compared with the prior corresponding period across the airline group and in the key Australian domestic market. Meanwhile, the company said ineffective fuel hedging and restructuring and transaction costs totalled $24.9 million in the fourth quarter of 2014/15. And underlying cost per available seat kilometre excluding fuel “continued to decline”, Virgin said. Virgin moved to quarterly reporting of its financial results to be in line with one of its major shareholders Singapore Airlines (SIA). The company will publish more details about it 2014/15 financial results on August 7. SIA, which accounts for Virgin’s financial performance in its own quarterly reporting, was due to publish its latest results on later on Wednesday. 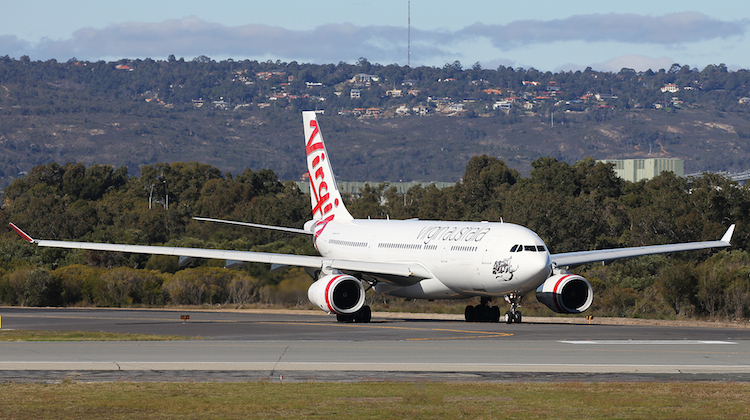 Tigerair, which is 100 per cent owned by Virgin, recorded an underlying loss before tax of $9.8 million for the three months to June 30, down from a loss of $25.8 million in the prior corresponding period, Virgin said. “This result was driven by continued improvement in unit revenues and cost efficiencies,” Virgin said. Qantas, which is tipped to post a statutory net profit above $600 million for 2014/15 according to market estimates, hands down its full year results on August 20. On the capacity front, Virgin carried 1.6 per cent fewer domestic passengers in the three months to June 30 2015 compared with the prior corresponding quarter, with load factors falling 1.6 percentage points to 72.7 per cent. Virgin reduced capacity, measured by the number of available seats, half a per cent in the fourth quarter. On the international front, Virgin the number of revenue passengers dropped 3.4 per cent, while load factors fell to 76.9 per cent, from 79.3 per cent previously. Tigerair, which only flies domestically in Australia but was expected to be used on international short-haul routes at some point in the future, posted a 3.2 per cent increase in passenger numbers in the fourth quarter, resulting in load factors rising 4.7 per cent to 82.4 per cent. Capacity, as measured by available seat kilometres, rose 6.8 per cent. Virgin shares were up about half a per cent at 44.7 cents in early trade on Wedneday. haha! How do you make a small fortune in aviation? How long can they keep this up?? They can’t even fill they aircraft they have let alone make any money… How do you expect them to purchase new metal?? How much money are their invested willing to pump into VA / loose?????? The B777s in the VA fleet are utilised only to Abu Dhabi and Los Angeles. Seems to me it’s too big an aircraft for their fleet and it’s quite evident from the amount of money that they are losing. I personally think the B789/A350-900 seems to be the perfect fit aircraft for their long haul operations. B777X/A350-1000 is too big for VA operations. I’m not suprised. In Febuary, I went to Florida and we flew Virgin Australia from CBR-BNE-LAX & LAX-SYD-CBR. Both international flights, premium economy was only about half full. On our flight from SYD-CBR, the 737-800 (that was ment to be a E190) was half empty.On top of this the majority of the passengers were Virgin Australia flight attendants & pilots who were probably flying for free or at a lower cost. However there is a plus side to this, my father & I had 3 seats each and my mother & sister had 3 seats together. Seems Singapore Airlines, Air New Zealand and Etihad are investing in another loss making airline.